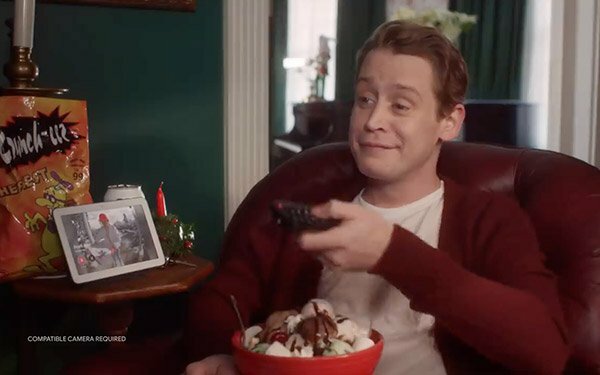 Operation Kevin -- just in time for the holidays -- comes to life in a Google advertisement in its remake of "Home Alone," with a 38-year-old Macaulay Culkin replaying his role as a kid. In the latest version, Culkin seems a little less alone with the Google Assistant to entertain him and help him stay safe around the house. Culkin’s character Kevin McCallister in the new ad, released Wednesday, lets the man look back at the witty 8-year-old’s adventure. With the help from Google Assistant, the actor brings many of the scenes from the 1990 film to the present day in a one-minute spot. "Hey Google, what's on my calendar today?" McCallister asks. The virtual assistant replies "You have one event called, 'House to yourself.'" And when McCallister gets a pizza delivered after paying online, the Google Assistant helps through a movie he is watching as he tells the delivery guy to "Keep the change, you filthy animal." When the thugs arrive, McCallister gets Operation Kevin underway. The lights in the house turn on, the fireplace ignites, the doors lock, and a robot vacuum cleaner spins across the floor with a cutout of a basketball player standing on it.